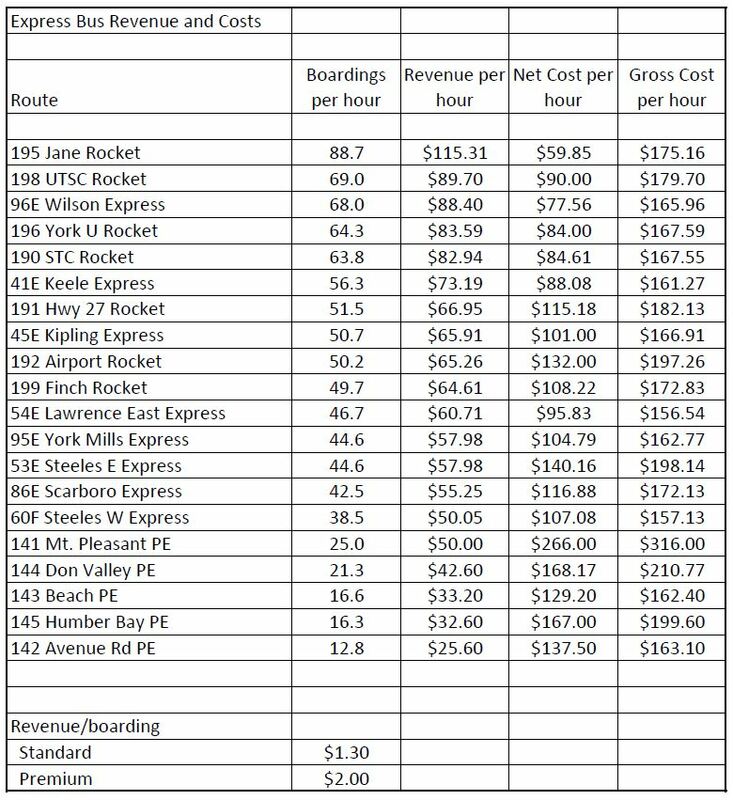 Updated June 19, 2017 at 3:30 pm: The TTC has clarified that the hourly costs shown for various routes are net costs, not gross costs, and this addresses my concern that some of these values were understated. The text of this article has been updated where appropriate. 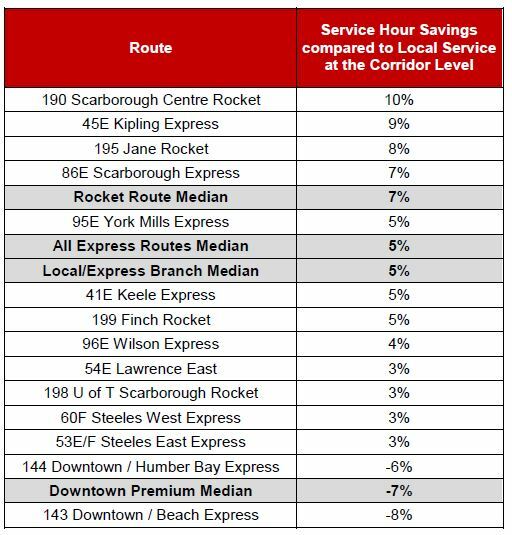 Updated June 20, 2017 at 10:30 am: A section has been added on gross operating costs (the TTC study includes only net costs) to illustrate how these vary from route to route. 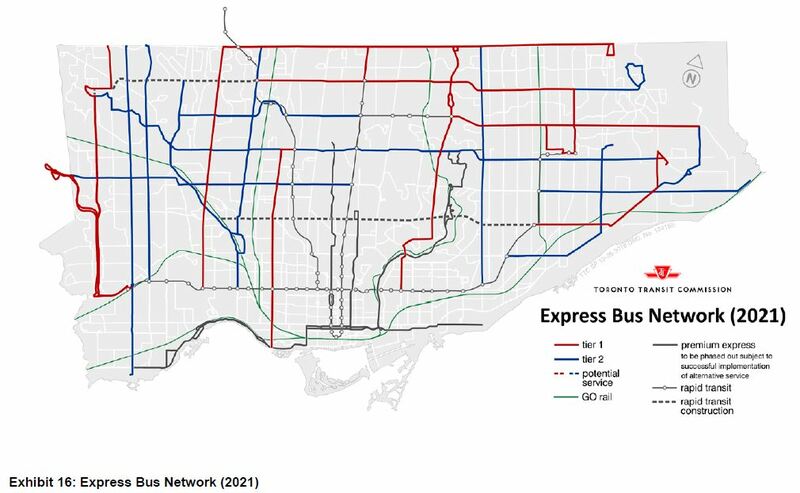 The TTC Board recently approved an Express Bus Network Study that proposes several new and enhanced express routes in Toronto. The premise of the study – improving the bus network’s attractiveness and convenience to riders – is a good one addressing the basic function of any transit system. However, thanks to the TTC’s severe constraints on capital and operating funding, the actual implementation of these proposals drags out for the better part of a decade. Bus planning in Toronto is converging with new subways for a lengthy gestation period. The (mainly) peak period services usually signified by an “E” suffix on the route number. Typically, buses will run express over part of a route stopping only at major transfer points or destinations, and will continue as local service on the outer part of the route. These services are useful for riders who would otherwise face a long stop-and-go trip on a local bus for their entire journey. By carrying the long-distance riders express for part of the trip, the cost of route operations is reduced from that of an all-local service and provides a more attractive service overall. 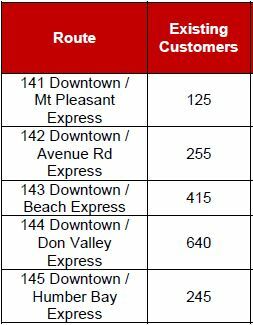 The Rocket services (route numbers in the 18x-19x series) operate for most of the day on weekdays and weekends, and provide a more limited stop service, end-to-end, than the “E” branches. Some are designed around major endpoints such as the 192 Airport Rocket from Kipling Station to Pearson Airport, while others more closely resemble the stopping pattern of “E” services. Unlike the “E” branches, the Rockets do not necessarily duplicate the route of a local service. The five Downtown Premium Express services (route numbers 14x) charge an extra fare for the privilege of avoiding the crowded Yonge subway and the 501 Queen car. The TTC proposes an interim classification of the first two of these as Tier 1 (Rockets) and Tier 2 (“E” branches) with the intent of coming up with some sort of branding that could be used to market them. Some cities have special bus services with their own names such as Hamilton’s B Line Express and Vancouver’s 99 B-Line. Given that there already is an established name for Tier 1 with a strong Toronto reference, it is hard to understand why a new brand is required. As for the Tier 2 services, riders are well acquainted with the “E” convention (broken in rare cases such as 60F Steeles West). The first recommendation of this study is that a marketing effort is required to brand these services. That says a lot about where the TTC’s focus has been in recent years – selling the “pizzazz”, to quote a former TTC Chair, while the system gradually declines thanks to penny-pinching by two successive City administrations. Growth of express services is limited as much by the political question of transit funding as it is by planning and resource constraints within the TTC. 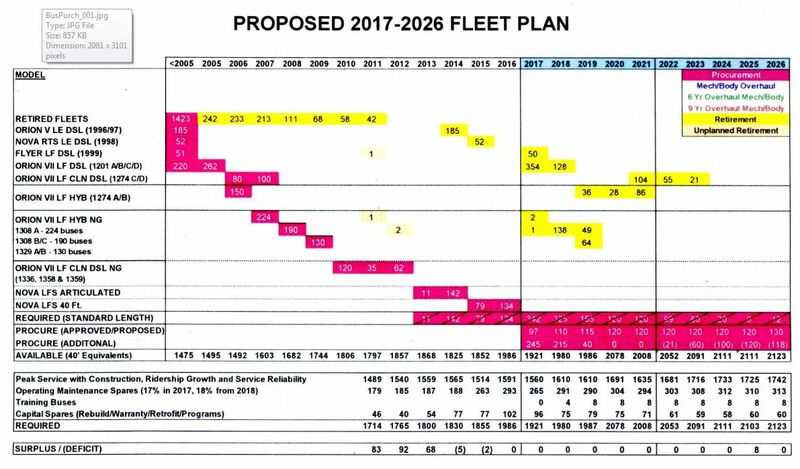 The TTC’s bus fleet plan should be thoroughly reviewed to determine how more buses can be made available for service sooner than 2019/20 when McNicoll Garage opens. TTC budgets should reflect a return to full streetcar service on the streetcar lines in 2018 and the redeployment of replacement buses back to the bus network. Express bus routes that were added in 2016 have performed better than expected showing that these are popular services and should be expanded as soon as possible. New Rocket and express routes are proposed in two waves, one for 2019-21 and the second with a tentative date of 2026. Costs and revenues allocated to existing and proposed routes should be verified. Revenue allocation in a flat fare system can distort the benefit of a route, and the measure of value should be based on usage not on a misleading allocation of fare revenue. Express buses provide a means of carrying riders on a route with a mix of short and long haul demand more efficiently and attractively than an all-local service. Riders on express services travel further than on local services taking advantage of the faster trip between major points on the route. There are fewer riders per bus kilometre because there is less turnover of the passenger load on express services. Express buses cost more per ride than local buses because of their lower turnover (i.e. more riders), but the overall route cost is lower with a mix of services. A proposal by one member of the TTC Board to charge extra for express routes would be counterproductive. 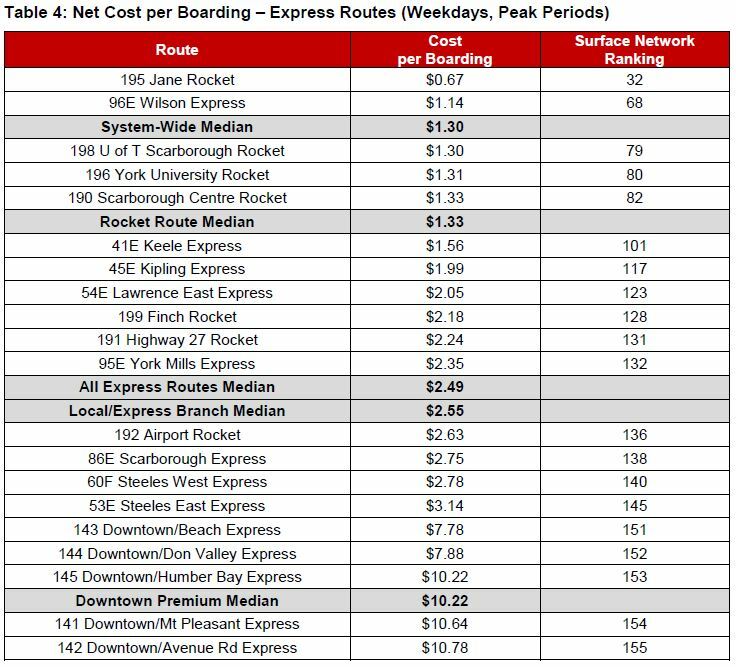 The Premium Express buses to downtown operate at a very high cost per passenger, although this needs to be verified in light of the issue with cost calculations. Demand on these routes is relatively light, and they contribute only trivially to reducing demand on parallel services. The TTC proposes to leave them in place at least until 2021, but this should be reviewed even though removing the services will be politically challenging. Transit Signal Priority is not just an issue for an Express network, but for transit in general. It should be pursued on major routes whether or not they include express operations. Route supervision will be essential to maintaining reliable service not just on express routes, but on the transit system overall. The staff proposal to “brand” services continues the TTC’s focus on marketing when what is needed is service. 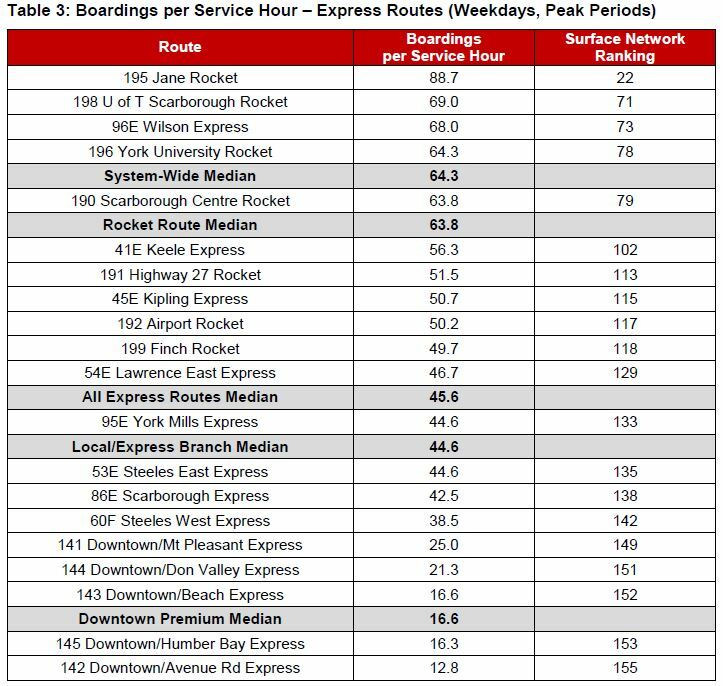 The “Rocket” name is already well-established as a service type in Toronto, as are the “E” express branches of various routes. In a few cases, the “wrong” name is associated with a service (some “rockets” are really just “E” services in terms of their service patterns), but this does not justify a complete rebranding exercise. In the short term, the TTC claims that no new services can be added to the network because of the shortage of vehicles and the lack of garage space. Both of these statements should be challenged. As the Flexity streetcar fleet builds up, the need to operate buses over major routes will evaporate. Indeed, the current situation with 65 buses on 501 Queen is due more to the convergence of many construction projects than it is to a streetcar shortage, although it gives the TTC a convenient way to reduce the total need for streetcars. Construction delays due to the TYSSE are largely out of the way and that line will open in late 2017. The net requirement for buses should go down in 2018 for services in that corridor thanks to the end of construction and shift of riders onto the subway. Construction delays due to the Crosstown LRT will probably last into 2019 when structural work at stations will reach a point that road lane occupancies will no longer be required. The TTC’s decision to increase its spare ratio for buses took a chunk of service off of the road. However, as the oldest and least reliable parts of the fleet are retired thanks to a very large bus purchase now in progress, it should be possible to reduce the spare ratio, at least for the short term. A substantial portion of the bus purchase trumpeted by Mayor Tory to improve service actually went to increasing the spare ratio, not to service on the street. The total number of buses planned for service when Mayor Tory was elected in 2014 was 1565, and the planned number for 2017 is 1560. Meanwhile the provision for spare buses has risen from 188 to 265. 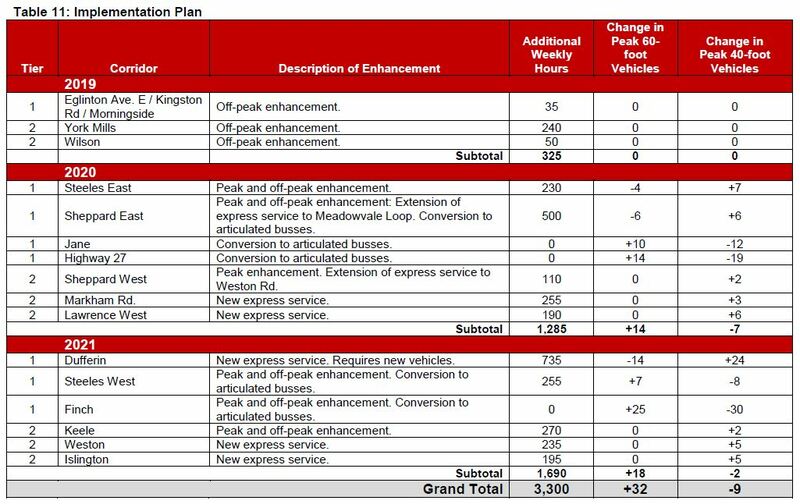 One big problem for anyone touting the purchase of new vehicles is that any service increase requires more operators, and that is a cost pressure the TTC Board and Council fight against constantly. Whether there will be enough streetcars to restore full operation on Queen and other routes early in 2018 remains to be seen. If there are, the TTC faces the added cost of actually using its buses on bus routes, not as streetcar replacements. The garage situation is not much better. 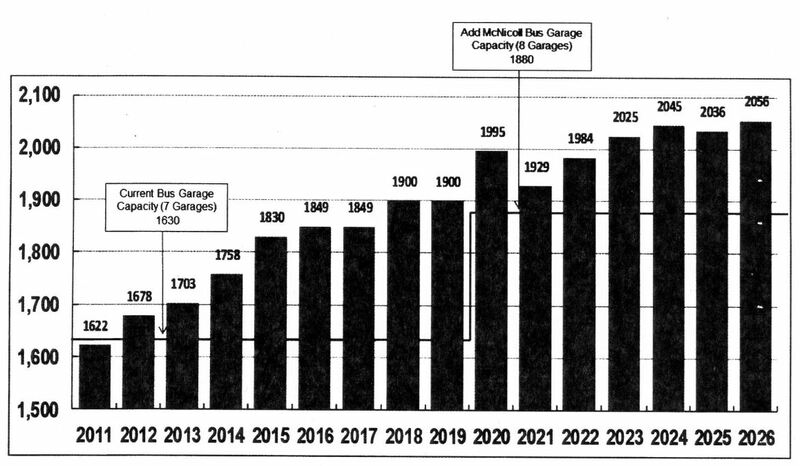 Even after the opening of McNicoll Garage, the system will still be over capacity by 176 buses, close to the equivalent of another garage, in 2026. There are no plans in the Capital Budget for such a garage. The overcrowding situation at garages will continue for the foreseeable future, and will likely remain one of the standard excuses for limits on service improvements. To put it another way, one must ask whether the scope of any proposals such as the Express Bus Plan is dictated not by actual system need, but by political constraints on capital, facilities and operating subsidies. 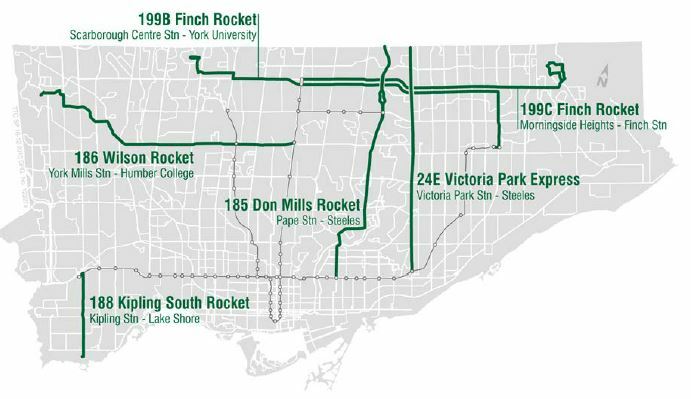 In March 2016, the TTC added four new Rocket services and one new Express branch (counting both Finch Rockets as one route). Results for the Rocket services were generally better than expected with ridership coming in above the expectations. The only shortfall was the 188 Kipling South, but this is not surprising when one considers that the travel time saving (4 minutes one way) is less than the headway of the express service (7’30”) making it not worth the wait unless it is in sight when a local 44 Kipling South is available. There is no question that riders like and will use express buses (whatever they are called) because their trip is faster. However, from a planning point of view, the implementation of a new route is not as simple as just rejigging the available vehicles. Many routes have strong local demand, and the more stops that are removed to create an express service, the more riders are excluded from using them. A good example was on Jane Street where service between the 35 Jane and 195 Jane Rocket was rebalanced to better match local and express demand. The proportion of express riders varies from route to route (even between route segments) depending on local demand patterns. In some cases, a new express service requires a net addition of buses, especially if substantial net new riding is expected, and this runs headlong into the TTC’s budget constraints. Attracting new riders costs money, a fact that many members of the TTC Board and Council simply cannot understand, much less accept. An important factor in getting the best utilization out of transit vehicles is the full use of internal space. This is especially important on routes with a high turnover of riders at stops along the way. Space is needed for people to move to and from the door, and bottleneck caused by passenger flow and vehicle design can reduce the effective capacity of a bus. The TTC proposes to move to all door boarding on its Tier 1 (Rocket) services at a future date, but not now. This change will require fare inspectors for the bus network, and they will be much more dispersed across the city than they are now on the dense streetcar network. As a trial, the TTC proposes to move to all door loading on 192 Airport Rocket in 2018, but this is an unusual route with few stops, one of which is already a paid area (Kipling Station). This may not be an ideal pilot for a wider rollout. Although the map of proposals includes what is now called the 190 STC Rocket, it does not appear in the tables of Tier 1 and 2 services in the study [see pp. 38-40]. The existing 196 York University Rocket will cease operation when the subway opens in December 2017. The study also proposes a first group of new express services by 2021. Some services that are now styled as “Rockets” would be reclassified because their hours of service would not qualify them as Tier 1 routes (e.g. 186 Wilson Rocket and 188 Kipling South Rocket). Some services overlap on this map such as the UTSC Rocket and the Scarborough Express to Meadowvale, but only one type of service is shown. The resources required for these services are detailed in the study. The plan is based on the acquisition of 32 new 60-foot articulated buses plus spares. Provision for this will be included in the 2018-2027 Capital Budget. Note that deliveries would be in 2020 and 2021. There is also the question of how Line 6 Sheppard LRT might fit into the overall scheme, and of course there is political pressure for extending Line 4 Sheppard east to STC and west to Downsview. Updated: According to @ttcdesign on Twitter, Finch will be line 6 because it will open before Sheppard East whose status is uncertain. The Express Bus report refers to Finch West as Line 7. Nine years is a long time to wait for new services particularly when they do not involve the long lead time of subway planning and construction. Such is the state the TTC finds itself in thanks to politicians whose only interest is in big ticket, photo-op projects, preferably those paid for by other levels of government who can be blamed when they don’t materialize on time. In theory, even at a few percent a year, TTC ridership will have grown by close to 20% when this map gets filled in, and even more if the system could actually succeed in becoming more attractive. The resources needed for express bus routes will be small change beside the overall demand on the TTC’s bus fleet and network. The TTC faces constant political pressure to justify the money it spends on service and to produce some measure of the financial worth of a route. This can produce contortions such as tradeoffs between operating subsidies and the imputed value of time savings for riders. Sometimes the wider goods, such as reduced traffic congestion and the environmental benefit of shifting trips to transit, are invoked, although not in this study. These values do not include any capital costs for vehicles or facilities. The problem with this scheme is that it assumes all trips have the same number of boardings. (Another way to say this in planning lingo is to assume that the ratio of unlinked trips to linked trips is constant across the system.) This is not true, and the result is to overallocate revenue to trips with more than the system average ratio, and underallocate it for those below that line. The “worst case” situation is a “one seat ride” where there is no transfer, and the formula allocates considerably less revenue to the route used than it actually deserves to get. Conversely, trips using more than two routes (roughly the average for all trips) allocate more revenue than the rider actually pays. The effect is to divert, on paper, revenue from routes that have many “local” trips that do not involve transfers. A further complication is the presence of flat-fare media (passes) whose users pay less per trip than those travelling on single fare media such as cash, tokens and Presto (unless they have a pass loaded onto their card). Adding or removing a service not only changes transit’s attractiveness for riders, it can trigger peculiarities in revenue allocation. For example, if a trip that formerly required a transfer becomes a one-seat ride, the allocated revenue goes down because there are fewer boardings even though nothing has changed in the rider’s journey. Revenue figures cited for routes should be regarded with caution because of these effects. The much more important question for any route is this: are people using it? The cost of carrying riders varies immensely from one part of the system to another, but each part contributes to the overall goal of moving people. Inherently unreliable and potentially biased revenue allocations should not be used to create a “profitability” score. It is ironic to note that the first two criteria were used by most agencies surveyed, and the proportion fell to only a third for trip distance and financial standards. Another way of looking at this is that making rides faster, optimizing operations and supporting land use goals were more important than financial targets. By implication, those goals justify the investment. This is a basic fact of transit economics that is, to be kind, overlooked in many of Toronto’s debates. Where both a local and an express service co-exist, the express service can hive off riders from the locals so that, in total fewer buses and bus hours are required to move passengers. For example, if the express service runs 10% faster, it requires 10% fewer buses and operators. (The vehicle mileage remains the same, however, because the 10% fewer buses run 10% further per hour.) This produces savings which vary from route to route depending on the speed benefit gained. 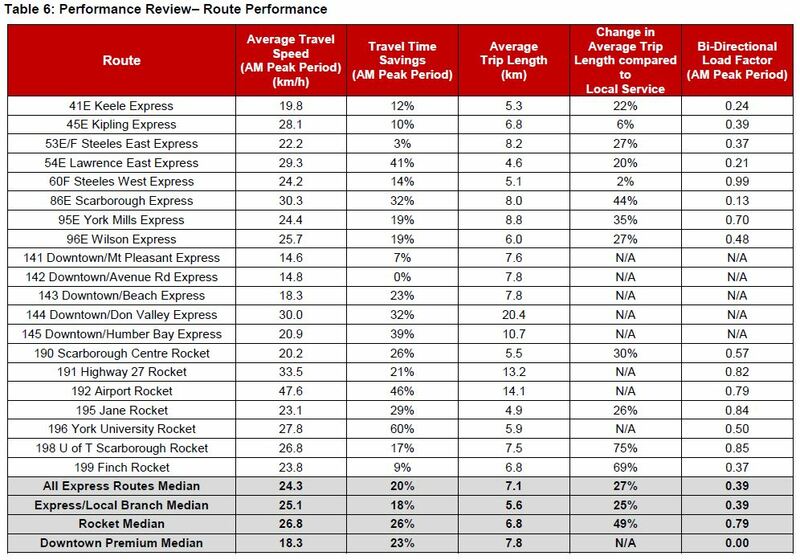 The Rocket services show a better improvement because their speed relative to local services is higher thanks to the limited number of stops enroute. The “Premium Express” buses are quite another matter, but I will discuss these separately. The two tables below present these savings from different points of view. Table 2 gives the saving in operating cost of the express services over what they would have cost operated as locals. The second table (unnumbered in the study) blends in the cost of local services in each corridor to show the level of saving for the corridor, rather than just for the express operation. The demand on the express services varies considerably from route to route, and is worst on the Premium Expresses. Note that many of these routes also operate during off-peak periods, but their ridership is not included here. If a route has strong bi-directional demand, the buses pick up riders in the “counter peak” direction, not just as a service taking riders to (or from) one point such as a university campus or subway station. If a route has enough stops, demand patterns will exists not just for the endpoints, but between stops along the route. This allows a bus to turn over its load and handle more boardings than would be possible if everyone wanted to go to the same destination. If a route is short, the turnover rate necessarily goes up because one boarding does not require as many bus hours as on a longer route. If a route operates comparatively quickly, fewer service hours required to carry a load over a trip, and the boardings per hour go up. The important point here is that the performance of any specific route, or the median of them all, does not necessarily indicate how any new service might operate, nor should it be seen as a target to which services should aim. Each route’s characteristics affect its operating cost. The same situation applies to local services where the cost per boarding varies immensely from route to route, and very short routes typically have very low costs per boarding. It is simply impossible for a rider to consume much time on a short route before being forced to get off. The cost per boarding for express services is actually fairly high even though provision of expresses reduces total operating cost. The reason for this is that the expresses draw the relatively expensive riders, those who are travelling longer distances and benefit from the express service, while the local trips remain behind on the local route at a comparatively low cost per boarding because there are more short trips, turnover and boardings per service hour on the locals. 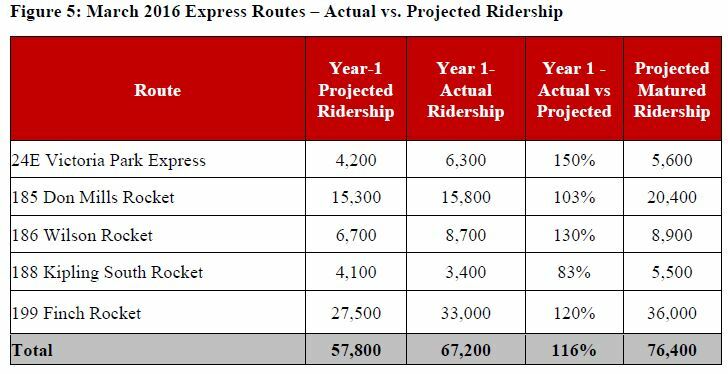 Again, this is an example of the dangers in looking at only selected parts of an operation and concluding that express buses are “more expensive” and might even warrant a higher fare. Update: The costs shown in the table below are net of allocated revenue. Routes with a high boardings/hour value will be allocated more revenue/hour and have a correspondingly lower net cost/hour. Update (text deleted): The validity of these numbers bears further scrutiny as we will see below. The cost per service hour varies considerably from route to route, and a great deal of the difference comes from operational issues that are not directly due to “express” service per se. For example, if the proportion of hours required to get buses between a garage and a route are higher compared to hours spend actually serving the route, then those “deadhead” hours count against costs but provide not direct service. This can be affected by the distance from a garage to a route as well as by the number of hours the service lasts. For example, many of the Rocket buses stay out all day and their garage trips are a comparatively small part of their total hours. Express buses on the other hand tend to be peak only, and can run up a substantial cost just getting to and from service. Premium Express buses may travel a long way from their garage to reach their route, make only one trip, and then return to the garage. The cost to serve that one trip is very high per hour because there is so much deadhead mileage. 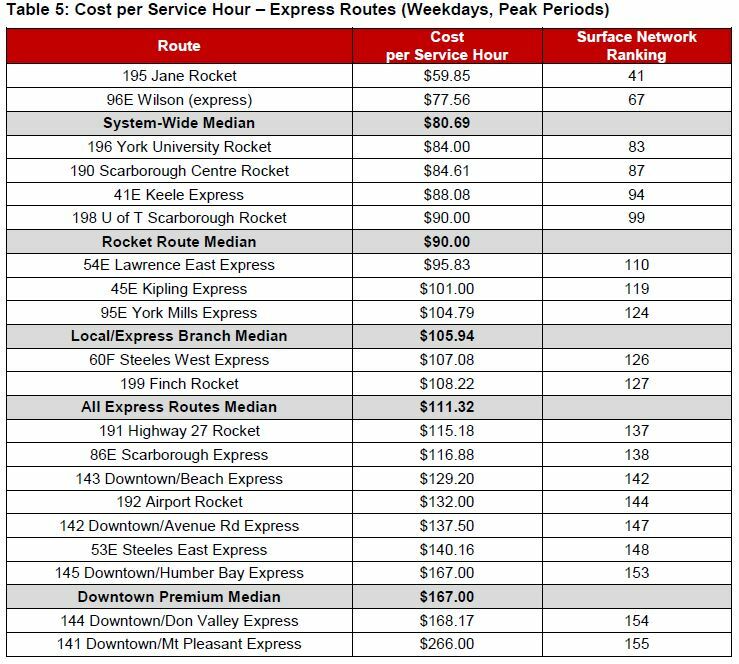 Update (text deleted): These values do not make sense because the cost per service hour is well below the allocated cost/hour of service ($92.30) for several routes, for the system-wide and rocket medians. This should not be possible. The very low cost for 195 Jane Rocket is particularly suspect. The gross cost per hour will vary between routes for three reasons. The faster a route operates, the more mileage buses will accumulate per hour, and this will increase the contribution of the distance-based element to the total. Fewer buses are needed to provide service on faster routes, but their allocated operating cost per hour is higher due to the distance component. The proportion of deadhead mileage for each route depends on the distance from the garage and on the length of the peak period. If a bus operates only a single trip, then a higher proportion of its total mileage and driving time is taken enroute to and from the route increasing the effective hourly cost of actual in service time. The fixed cost of vehicles is allocated against in service time, and the fewer hours a vehicle operates, the greater the contribution of this factor. The revenue allocated to premium fare boardings is only $0.70 more than for standard fare services even though the premium is at least $2.00 per trip (via Metropass sticker), or a full extra fare (cash, ticket, token). This could understate the revenue actually due to these routes, especially if their customers are primarily “one seat” rides where the entire fare should be allocated to the boarding, not just a partial value. The gross costs would not change, but the per hour and per boarding net costs would be lower. The net cost per hour of the 141 Mt. Pleasant Premium Express is particularly high. The issue here is that assumptions built into cost and revenue allocations can affect the standing of various transit services. If these assumptions skew the purported “profitability” of routes, this can lead to misguided policies. The table below contains interesting comparisons of the express services with their corresponding local routes. The average trip length on expresses, where there is a local for comparison, is generally longer showing that the express service is attracting those riders for whom the speedier service is a real benefit. Where the change is low, this suggests that riders get on whichever bus shows up first rather than waiting for the express. 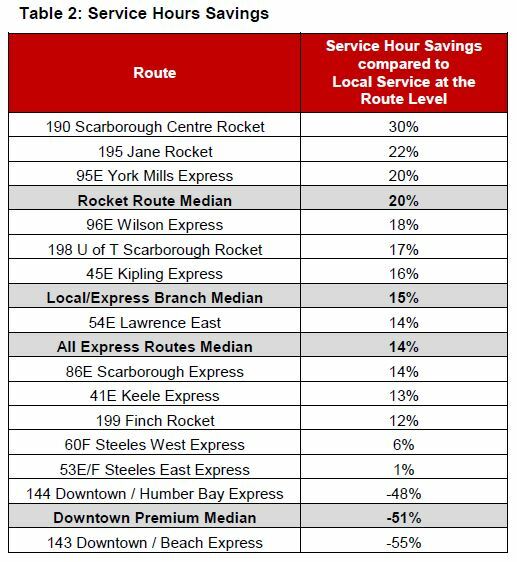 The travel time savings, as a percentage, vary depending on the speed of the express and local services. The bi-directional load factor shows the degree to which each route serves destinations in both directions such as a subway-to-campus link. This shows the importance of looking at service design and stop patterns without overemphasizing a specific destination. Not every rider wants to get to a subway station for a trip to downtown. The Premium Express Routes are historically poor performers with low demand and high cost, although this has not routinely been reported as part of the occasional system stats. These routes exist as much thanks to political intervention in their respective origins as they do from any planning principles or standards to which other routes are held. Any attempt to kill them off and reallocate their vehicles is met with a call to “just give them more time” to reach reasonable performance goals. The Don Mills, Beach and Humber Bay services exist at the specific behest of local Councillors who, at the time they were implemented, were members of the TTC Board. This is not to say that they do not provide a service to their riders, but one cannot regard them as anything more than bandaids to fix problems in specific neighbourhoods. The idea of a point-to-point service into the core is only remotely feasible when there is an uncongested corridor for truly “express” operation. In the case of the Beach and Humber Bay services, the “problem” being addressed is the poor service on Queen over many years, and resources might have been better focused on that route’s problems than on serving a portion of that route’s demand with a premium service. In the case of the Beach and Humber Bay routes, future capacity improvements with new streetcars on Queen, plus a future Waterfront West LRT taking a quicker route into the core, could replace these bus services. In the case of Avenue Road and Mt. Pleasant, improvements to service on the Yonge line could actually provide space for riders to board at Eglinton inbound. The report cites the 20% improvement in subway capacity possible with automatic train control, although the TTC does not actually own enough trains to operate this level of service, and a good deal of any capacity increase is likely to be backfilled by latent demand further north. Such a review would not take place until 2021, and so existing Premium Express riders need not fear for the imminent demise of their service. 4. [That the Board] direct TTC staff to work with City of Toronto Transportation Planning and Transportation Services staff to implement transit priority measures including transit signal priority and queue jump lanes for existing express routes and report back jointly on progress. TSP is a benefit that all transit routes, whether they have express services or not, can benefit from. For routes with mixed express and local service, there is the question of whether TSP can or should be implemented only for express services, or for all service on a route taking into account the different stopping patterns. 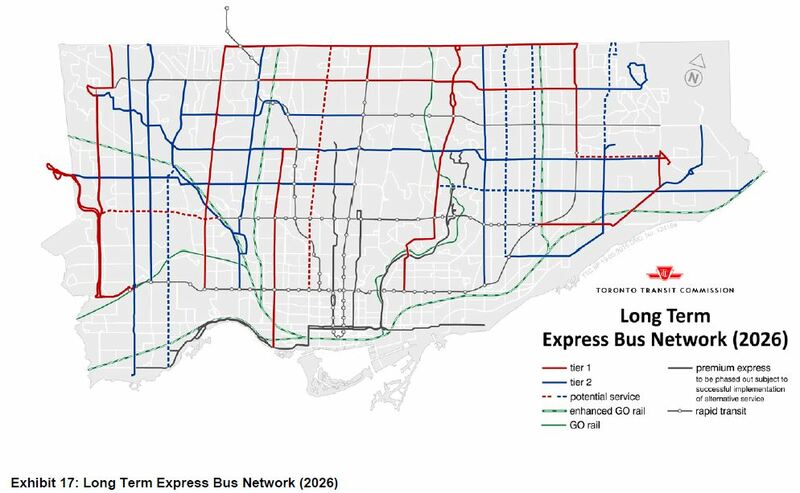 The map indicates that TSP is already in place on Jane and on Finch which have express service, and these routes could provide some preliminary information about benefits and challenges today. The TTC has long wanted to have queue jump lanes at certain locations where buses could scoot around the queue for right turns. Like TSP, these are physical changes that do not have to await the rollout of the new express network. The issue of service reliability is discussed frequently on this site, and I could not resist including this paragraph from the study. Effective route supervision is fundamental to the provision of good transit service. Route Supervisors undertake many types of work, all geared to ensure good service reliability including monitoring/adjusting transit service and responding to emergencies and customer service issues. On-street supervision is essential to providing good customer service because it allows direct observation of crowding and scheduling issues, with real-time adjustments as well as development of longer-term solutions. Route supervision will be vital to the initial roll out of many of the new express services. The VISION CAD/AVL system, which will be in place, will further enhance the route supervisor’s abilities to manage these services. VISION CAD/AVL is the TTC’s new system for Computer Aided Dispatching / Automated Vehicle Location that is in the preliminary stage of implementation. It will replace a three-decade old system that provided substantially less functionality for route supervision and management. The real challenge for the TTC will be to adjust its “culture” to reflect the abilities the new system will provide. This entry was posted in Buses, Service Cost and Quality, Transit. Bookmark the permalink. ← What Is The Scheduled Service Capacity on Queen Street? Maybe the TTC should follow its own advice, NOW? “Effective route supervision is fundamental to the provision of good transit service. ” As your analyses of current streetcar and bus routes shows VERY clearly, the current route supervision is totally ineffective and cannot even deal with on-time departures from termini – where the new VISION/CAD/AVL information is hardly necessary. Why do tables 2 through 6 not include the new routes (24E, 185, etc.)? Seems odd because data is now available for their first year, and for something like trip time savings those can be read right off the schedule. Steve: I really don’t understand what the Service Planning folks are up to on this. I really do wish that TTC ordered buses with rear windows, so you can see if an express bus is catching up to your local at a transfer point. This gives the option to switch buses if your destination is an express stop. Speaking of annoying announcements, the Flexities are now remarking “Look right for traffic when exiting” at all stops, even if it’s a protected island or a route entirely in the ROW like Spadina. Why are the Premium services badly patronized? Well, part of the clue is in the name. I have long argued that if this premium business be clung to then the premium should at least be reduced to something nominal, like 1 token + $1. But now that same-fare expresses are proliferating, the argument for not integrating the 14X routes into the network is bunk, especially when we know that the capacity improvements from TRs and the ones coming with ATC will not be sufficient to reduce crowding materially. Just look at how UPX performance took off when the fares were cut, and that was without proper integration into other GO fares/zones. 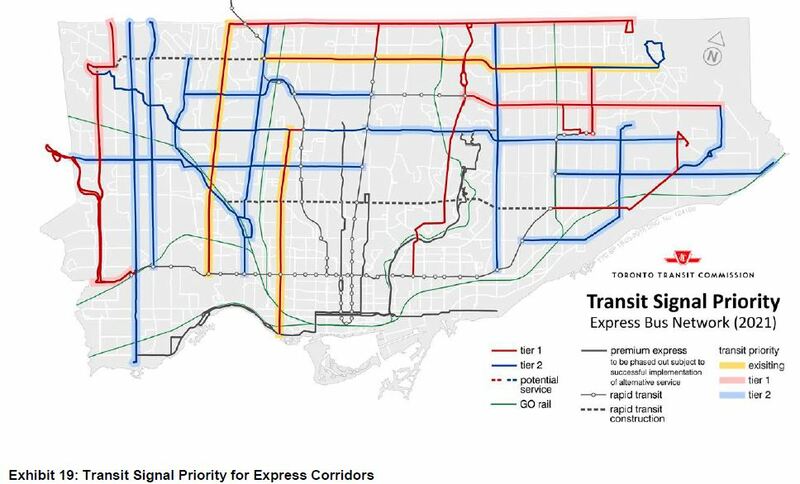 It seems to me that like the 2-hour transfer only being operative on St. Clair nine years after the pilot, and the meagre provisioning of Community Bus routes, the continued designation of 14X as Premium seems as much about inertia than anything else. Steve: The TTC’s concern is that the economics of the routes won’t improve even with the lower fares because of the comparatively high cost of providing the services. That said, I await feedback from them on my concerns re costing and revenue allocation. My gut feeling is that they are politically motivated wastes of resources, but prefer to feel more certain about the figures first. There is also the issue of bandaid solutions to capacity in the Queen corridor for a small number of riders rather than addressing basic issues. From the west, a big problem is the Humber terminus, but the proposed Park Lawn Loop was taken out of the budget to save money. The Waterfront West project really needs to look at where an appropriate place to take the Queen car should be. Humber Loop is a relic of the old city/suburbs zone boundary. In 2003, the TTC came out with a Ridership Growth Strategy. That was fine until Rob Ford became the Mayor and basically ended it. John Tory has not returned to that strategy, especially the need for stable funding, which he has refused to do because of his demand for cuts, cuts, and more cuts in the operational budget for the TTC. While some of the recommendations definitely need updating, that original strategy needs to have a version 2.0 and desperately. Steve: A new version does exist, but it was not published last year because with the budget situation, it was clear that it would be a lost cause. TTC’s Brad Ross advises that it will probably show up in September, but I will believe that when it is actually on the agenda along with the 2018 budget. 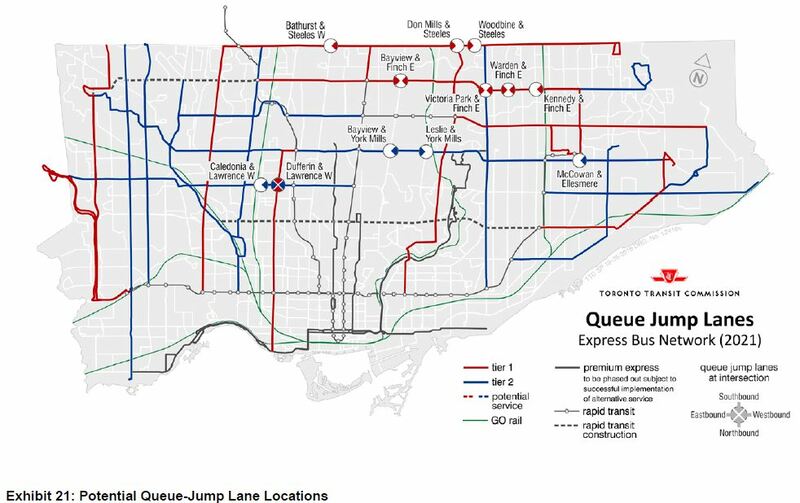 I think it’s good that the TTC is looking at improving express bus services, and talking about some infrastructure like queue jump lanes and TSP. I just wish they advocated more on building reserved bus lanes. Streets like Finch, Steeles, Sheppard East, and Kipling all have wide right-of-ways. It doesn’t need to be fancy (like Viva Rapidways), but widening a few roads to maintain two car lanes per direction, and using bollards or simple curbs to reserve the centre lanes would make a huge speed difference during rush hours. The intersections may be a bit more expensive, with simple passenger platforms and redone traffic signals, but it’s still much cheaper than rail options, and would benefit all routes on the street. Just me fantasizing a bit. This whole thing is nuts. Long term planning years away for minimal results. It will never happen just like Tory’s Dumb Track. There are too many TTC Planning people and too few TTC “Doing” people. Express routes can be added NOW with little cost. Simply convert some local buses to Express and let riders decide what they want to use. This is at least a partial interim solution. KISS. As for a branding, they already have it. ROCKET! Stop wasting time trying to figure it out. Reminds me of the TORONTO sign. This turned out by accident ot be the greatest name recognition “branding” instantly accepted by all. Yet, there were people at Silly Hall repeatedly wondering what to do with it! Regarding the cost of “garage trips”. There is another KISS solution to much of this expense. Stop it! The purpose of a bus being on the street is to provide a transit service for riders. It is NOT to wear the rubber off the tires! It infuriates me when I see “Sorry buses” coming out from the garage near me and passing me by running empty to the end of the route to then return back in the other direction. There is no valid reason for much of this garage time. If need be start the bus out five minutes earlier and trim five minutes if need be. As for the 140 series Downtown Premium fare buses, these should immediately be turned into an Uber Pool style operation. It sure wouldn’t cost $92.30 per hour. The reason why express (or rocket) buses are so popular is that stops are too close together on the regular routes. Some bus stops are less than 300m from each other. I have the misfortune of riding the 36 bus this afternoon. The time was 13:00, visibility was excellent and the road was dry. Wind and crosswind was weak, basically ideal driving conditions. It took 1 hour to go from Dufferin to Highway 27. When the bus stops at every stop, even a 5km journey would take forever. The queue jump lanes are weak. When Mississauga Transit and YRT has rapidways running throughout, it makes Toronto’s effort looked not enough. It is better than nothing. The buses get new liveries once in a while as part of their maintenance budget. It would be ideal to have a new livery just for these express buses. Once the average Joe sees the express buses running on the street, it will help to get the support needed for more funding. This is where York Region should be applauded. They started Viva with its own fleet of vehicles and almost a separate system to YRT. Everyone knows that Viva is fast and YRT is slow. The more rail based transit gets build, the more buses it needs to feed those stations. Given that Smart Track and RER are in the pipeline, the projection seems a bit low. Remember that Smart Track is not running in areas where there is a large population near the stations. Those passengers boarding the 15 minutes or better frequency trains will come mostly by bus. People do not magically appear at the stations nor do they all bike to the stations. The lack of consideration for Smart Track and RER seems very short sighted. Everyone knows that it will appear by 2025. The catchment areas are also very large for GO stations, so most people will prefer to come by express bus. Guildwood VIA station also gets no love in this plan. VIA is planning to run high frequency rail service on their dedicated tracks between Toronto, Ottawa and Montreal. Instead of feeding all Toronto traffic at Union, some of the eastern Toronto traffic could be fed through Guildwood. If a rocket bus could run say between Scarborough Center Station and Kennedy Station via Guildwood, it would make intercity travel a lot easier. Steve: A point about liveries: For as long as I can remember, the TTC has been utterly unable to dispatch the “correct” vehicles for a route. Artics vs standard size buses and streetcars are the most recent problem, but I remember a time when there was a much more heterogeneous fleet on both the streetcar and subway networks. TTC would complain that the old vehicles were not reliable, but there they would be, out at all hours. If they paint a set of buses for “Rocket” service, or whatever, you can depend on them showing up on other routes, while buses in standard colours are on the Rocket lines. Keep it to a route name display. The TTC can handle that. Given that I’ve seen 192 Airport Rocket buses, with their custom wraps and luggage racks, on normal routes, I know you speak the absolute truth. They changed it so that Finch West LRT is Line 6 and Sheppard East LRT is Line 7. I believe this is due to Finch West opening before Sheppard East, which is paused indefinitely. See TTC Design on Twitter. Steve: Thanks for pointing this out. The Express Bus report refers to Finch West as Line 7. Steve, another great article – I enjoy reading and learning from them. Slightly off topic the streetcars have a roll sign that says Express (red in colour) – did streetcars ever run express or express routes? Seems kind of impossible, at least with today’s track structure. Steve: There was never express operation. I suspect the idea was to allow a car to speed ahead to restore service spacing, but I have never seen this done. When you describe the Tier 2 services, you mentioned that the 84E service is between Yonge and Finch West. However, in the report for new bus routes for TYSSE opening, it mentions that the bus route will be between Yonge and Sheppard West. Steve: Ooops. Yes, that should read Sheppard West, not Finch West. I have corrected the article. Thanks. Where does it come from that these are badly patronized? I’ve heard this for ever yet, for long periods I have used two different of these routes and both were normally standing room only, every day, both directions. It seems so bizarre to read over and over how ‘no one rides these buses’ and ‘I always see them empty’, sometimes literally while I was standing on the way downtown on that bus because every seat is occupied. The idea that it should be a “token+nominal fare” is bizarre because it already is. 99% of of the riders have a Metropass with an Express sticker. There are days the driver doesn’t have to flush any fare down the chute of the box at all. Steve: Which routes do you use? It would be interesting to contrast your experience with the riding counts in the report. Jonathan, the 145 Humber Bay express is very badly patronized. I would see it either along Lake Shore west of the Humber when I was taking the streetcar, or at various points on its express segment when I was riding my bicycle. In no case have I ever seen the bus with standees. Sure, there were times the majority of the seats may have been filled, but mostly it was maybe half-full. In the reverse-peak direction, it’s empty. Carrying bupkis. Nobody. You can do this with next vehicle predictions now. Sometimes, I used to get on the 8:06 145 Humber Bay bus at Ellis, and I usually couldn’t get a seat. I think the one or two buses run right at peak are pretty full, but the ones on the shoulder are pretty empty. Some things to improve them would be to charge regular fare in the reverse peak direction, try to run them more often over a shorted period of time and have a limited time sale where they would be regular fare to build ridership. Are the next vehicle predictors (e.g. Transsee) good enough with GPS to be able to give me good predictions? For example, if I’m riding 15 Evans and approaching Islington, will it tell me sufficiently in advance if there’s a 110A or 110B coming, to get off? And how easy is it to compare to whether I will be better off connecting with a 123B or 123C at Brown’s Line? Steve: There are a number of “gotchas” here, some of which you have noted. First off, any “predictor” using scheduled data is bound to be wrong because vehicles are rarely “on time”. Second, at some locations (but too rarely) Nextbus will consolidate info about all routes serving a stop, and so you can look up “what’s behind me” with one query. However this is inconsistent, and depends on how the TTC has defined each stop in its schedule export to Nextbus (which has an “other routes at this stop” function in the stop definition). Then there is the question of possible latency delay between the TTC and Nextbus. The actual location of a vehicle can differ from reality due to the data, by the time it gets to you, being a bit stale. Don’t count on it for a very tight connection in dropping back to a different bus. From 2008 to 2010 I used the 141 [Mt. Pleasant] almost daily. In 2015-2016 I used the 143 [Beach] a few trips per week. The only non-full bus I experienced was the evening trip home on the 141, which was usually only 2/3 full, unlike the trip in the morning which was a full seated load, and unlike the 143 where there were always people standing in both directions. Steve: The challenge both of these routes have is that they carry nobody in the counterpeak direction, and so a full seated load, on average, is only half a load. All of the trips are end-to-end (to or from downtown) with no local riding, and so the number of boardings per bus hour operated is lower than on a regular route. These two factors combine to give very low utilization and high cost when compared with regular routes, or even the “E” express branches which have both bidirectional demand and some degree of turnover of riders along their routes. A related issue here is that if the buses are already well-used on their peak trips, then the margin to attract new riders without adding service is lower than it would be if they were only lightly used. The very wide headways can’t help much either. Point to point services like these can sound good in theory, but they are among the most expensive transit services to operate per rider. In many other cities, garage trips are integrated into the schedule. The buses/streetcars will carry passengers almost all the way to the garage/yard entrance if possible. On the routes along the way to the garage, it ends up creating extra service early in the morning and late at night. Steve: The TTC used to integrate garage trips, and still does so (mostly) for streetcars. On buses, they turned them into “out of service” trips to reduce running time and save on costs. I have noticed that the both the maps and tables of the study indicate that the 53F service will be phased out to emphasize that the 199C will be the preferred express connection between Morningside Heights and Finch Station. In terms of the Sheppard East corridor, I think that the new route will be in the same format as the 199A/B, in the sense that there will be two “all-day” branches. One branch will go to STC (the current 190 route) and the other to Meadowvale. What I don’t want happening is the Meadowvale branch also going to STC and then go back onto the Sheppard East corridor. I live in Malvern and to get to STC, I use the Sheppard bus to McCowan and take a bus southbound from there. The transfer time does not seem signficant enough to warrant seamless travel between the two roads, as there are many buses that go to STC from that stop. In fact, it may be that a longer trip from Meadowvale to Don Mills will exist, if this express trip includes going to STC. In a previous study of bus routes for the SSE extension, TTC seems to indicate that they will be going in this direction (probably to force ridership to this dubious extension.) Hopefully, with community consulation, they will change their minds. You only need a GPS on your phone to find nearby stops (It is strictly optional with TransSee). It’s the GPS on the bus that is important. No one would say it is perfect, but it is pretty good considering the inherent unpredictability of traffic and departure times. You can find your bus fleet number to see when you will be there and see when the 110s will be arriving. You can bookmark this page for quick access if you take this trip regularly. I assume you wouldn’t need to make a decision until about a minute or less before you arrive, so the predictions should be pretty good. You can add 123 predictions as well, but your example is more complex then most. Transit App supposedly has this feature, but I’ve often been disappointed with the routes if finds compared to Google Maps. TransSee has a feature to show how old each vehicle location is. For the TTC it is usually about 5-20 seconds old. It has to be enabled in the settings. Just curious about this as I have overheard drivers before say they come into service from other routes, and when they go out of service they go back to a route. Does that not really happen, or not happen for most runs? The driver of the 141 back in the day would always say if he was late that is was because of traffic getting from the end of his Rogers Road route at Ossignton station downtown to do the 141. Steve: That’s an amusing hookup – a Rogers Road bus that goes downtown to become a Mt. Pleasant bus for an outbound trip. I know there are some hookups of this type, although these are easier in the afternoon when school trippers don’t land on top of the peak period. An obvious problem the TTC has is that there are few bus routes downtown, and those that are need there buses for their own peak period demand. The 145 Humber Bay express does run in service both ways in each peak period. For example, at Park Lawn and Lake Shore, there are five westbound trips in the morning (and six in the evening when that’s the peak direction). As these buses go into service from Queensway garage, this is seems like running back in service rather than deadheading. However every time I see a counter-flow 145 in service, it’s perfectly empty. Back in the late 1980s, before the premium fare, I did catch the Mt. Pleasant downtown express at one of its Jarvis St. stops a few times. It was a decent alternative to the overcrowded Yonge subway, or the overcrowded and infrequent Sherbourne bus. As for useful predictions, yeah, not quite going to be easy enough or accurate enough for me to bother with at this point. There seem to be some stages a transit user can go through: 1) Just sticking to the one routing they know/have been told to use; 2) Learning that there are various alternatives in a grid system like Toronto’s and exploring them; 3) Wanting to optimize their trip such that every trip they make the optimum connections and minimize travel time and hassle; 4) Achieving Zen wisdom, that only by renouncing the schedule and accepting random variations in service and travel times will they ever reach their destination in calm. I have seen people taking the 145 downtown in the evening. I wonder if they are people blindly following Google Maps directions. I can’t help but notice there’s only 1 express line south of Bloor. Where’s the express bus for Lansdowne, Bay, Parliament, Pape, Coxwell, Woodbine, and Main? Downtowners deserve express buses too. SHORT TURN! SHORT TURN! SHORT TURN! Given how much people were complaining about the $11 subsidy for UPX, the $10.50 subsidies for those premium express buses suggest that they should be cancelled as soon as possible. On a fare recovery ratio basis, those premium express buses seem even more outrageous.